Large animals have bony interior skeletons. But insects, including termites, have an exterior skeleton, referred to as an exoskeleton. As they grow, termites must shed their exoskeleton to form a new replacement exoskeleton. This exoskeleton replacement process is called moulting. A failure to complete the moulting process is always lethal to termites. This means that a toxicant that stopped termites from successfully completing the moulting process would be a reliable termite bait toxicant. The toxicant contained in Requiem Termite Bait, the bait component of Exterra, has this exact action. But how does ‘t act slowly enough to eliminate the colony? After consuming Requiem, a termite is killed when ‘t moults. However, not all of the termites in a colony moult at the same time. Depending on the time of year, it can take from six weeks to four months on average for Requiem to whittle down to a small number the group of surviving colony members as more and more members that have consumed Requiem eventually moult. Finally when only a few colony members are left, the colony normally collapses and is eliminated. Because the whittling down occurs so slowly, it ‘s almost impossible for the then surviving colony members to identify and avoid the substance that is causing the slow, gradual loss of other colony members. Requiem can take up to several months to completely eliminate a termite colony. However, it can drastically reduce the rate of wood consumption of a colony within four to six weeks after the colony starts consuming Requiem. This ‘s because while termites may take several months to moult and die after consuming Requiem, its active ingredient has other (too complicated to explain here) effects on termites that begin to occur within a few weeks of when termites first start to consume it. These effects interrupt a termite’s ability to consume wood. This means the amount of damage a termite colony is doing to a building it is infesting is reduced well before ‘t actually eliminates the colony. The active ingredient used in Requiem is very powerful. So powerful that ‘t needs to be present in Requiem only at a very low concentration. This concentration is so low that the amount of Requiem needed to completely fill one Exterra Station (400 grams) actually contains less than one-half of one gram of toxicant. But the active ingredient is low in toxicity to humans. But how can the active ingredient in Requiem be so effective in killing termites yet so low in toxicity to humans? Because the active ingredient has an action only against animals that moult and humans do not moult! As mentioned earlier, the active ingredient in its pure, concentrated form is less toxic than table salt. No matter how well a termite baiting system is designed or how effective an active ingredient it uses, if termites won’t eat the bait, it won’t work. That’s why extensive research was conducted to optimise Requiem to the appetites of termites found in Australia. Australian termites simply can’t resist Requiem. Too bad for them but good for you and your home. Requiem can eliminate all the termite colonies under and around a building. However, after a colony is eliminated, ground areas that the eliminated colonies previously occupied may be invaded by new termite colonies. This is why the interception and baiting process must be continued at your building even after the termite colonies active under it now are eliminated. 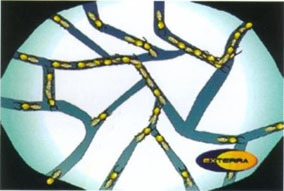 Termite colony elimination is the most important advantage of Exterra. However an important added bonus of using Exterra ‘s the significant reduction ‘n the amount of toxicant necessary to manage termites at a site when compared to barrier treatments. Just how large are these potential reductions? Let’s take an example. Some barrier treatments can involve the application of more than 5 kilograms of actual chemical toxicant mixed with hundreds of litres of water around a typical house. But Exterra replaces all this with a few grams of active ingredient. In some situations, using Exterra in place of a barrier chemical product can result in up to a 10,000 fold reduction in the amount of toxicant needed to manage termites at a site. Real reductions in exposure of applicators and the environment to termite management toxicants can be achieved when Exterra is used in place of a chemical barrier treatment. EXTERRA and REQUIEM are trademarks of Ensystex Australia Pty. Ltd.